In February 2019, a series of powerful, slow-moving storm systems dropped record-breaking rains on northern Queensland. Some areas received more than 1000 millimeters (40 inches) over a seven-day period, according to Australia’s Bureau of Meteorology. 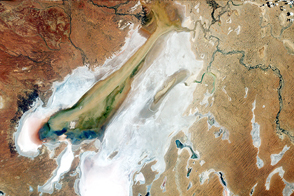 Much of this water drained quickly into the sea, but some of it fell within the low-lying Lake Eyre Basin. As water flowed south toward Lake Eyre (also called Kati Thanda) in South Australia—the lowest point on the continent—it filled wide, braided river channels that are normally parched, barren, and brown. By March, an ephemeral carpet of green—mainly sedges, reeds, and grasses—had emerged in the river channels and floodplain as flood water receded. In late-March, Queensland faced a second deluge. This time Cyclone Trevor slammed the coast of northwestern Queensland on March 23, 2019, and continued to produce heavy rains as it moved inland. 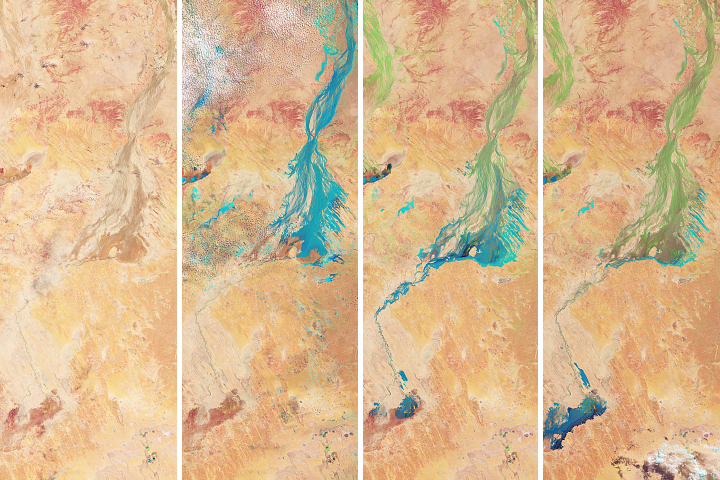 When the Visible Infrared Imaging Radiometer Suite (VIIRS) on Suomi NPP acquired this false-color image on April 1, 2019, another big pulse of flood water was flowing south through several rivers in the Lake Eyre Basin. 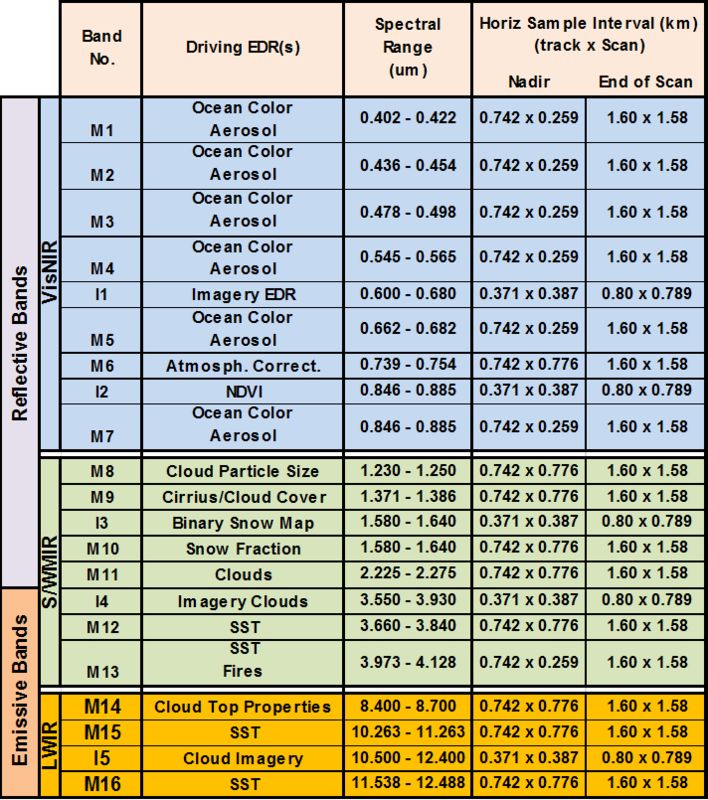 The image above makes use of a combination of visible and infrared light (bands M11-I2-I1) to make it easier to distinguish between land, water, and vegetation. 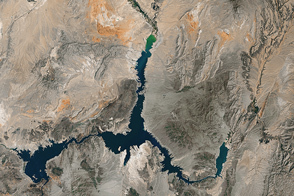 With this band combination, water appears light blue and vegetation is green. Water from the February rain event first reached Lake Eyre in mid-March, but some water was still visible in Lake Eyre in April. 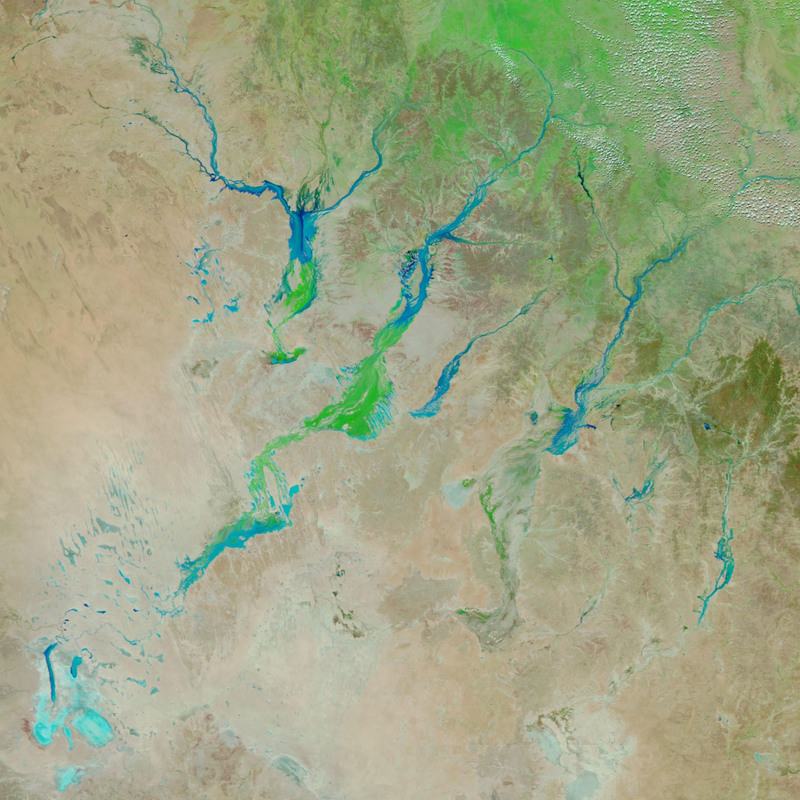 The green area on the Diamantina and Georgina rivers emerged after the first round of rain, while the water to the north of the green came from the remnants of Trevor. Typically, Lake Eyre fills up about once per decade, though rivers do deliver small amounts of water roughly every other year. Since much of the water currently moving toward Lake Eyre will be lost to evaporation, the lake might not fill completely. However, some forecasters say the incoming water could produce the biggest flood on the lake since 2012. 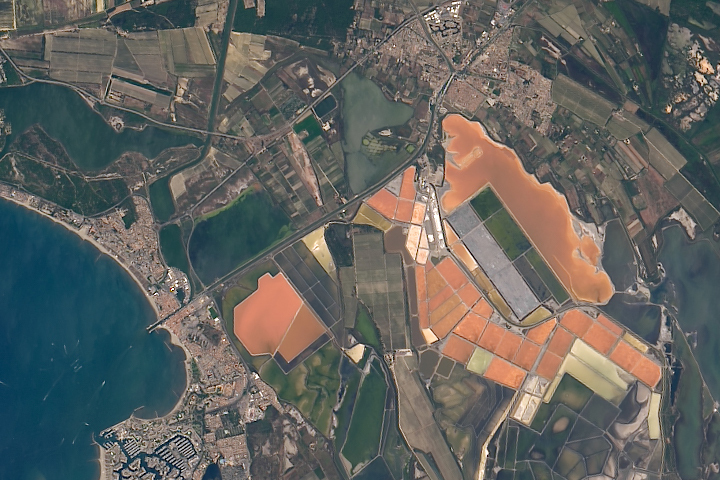 Even a partial filling of the salty lake will create a temporary desert oasis for birds and other wildlife. 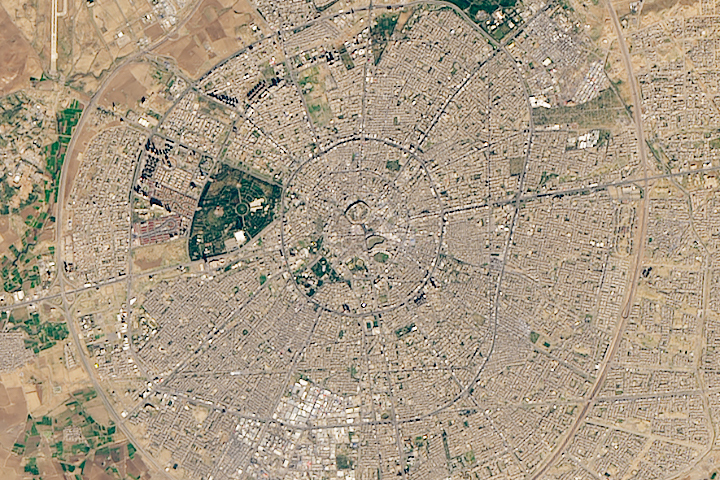 NASA Earth Observatory image by Adam Voiland, using MODIS data from NASA EOSDIS/LANCE and GIBS/Worldview. Story by Adam Voiland. ABC (2019, March 19) Lake Eyre begins filling with Queensland floodwaters as Birdsville roads reopen. Accessed April 2, 2019. Australian Bureau of Meteorology (2019, April 2) Flood Warning for the Georgina River and Eyre Creek. Accessed April 2, 2019. Australian Bureau of Meteorology (2019, March 19) Queensland floods: the water journey to Kati Thanda-Lake Eyre. Accessed April 2, 2019. National Geographic (2019) The rebirth of Lake Eyre. Accessed April 2, 2019. South Australia News (2019, March 26) Sailing in the desert as rivers rise. Accessed April 2, 2019. The Daily Telegraph (2019, April 1) Weather explained: Will Lake Eyre see its biggest flood? Accessed April 2, 2019.